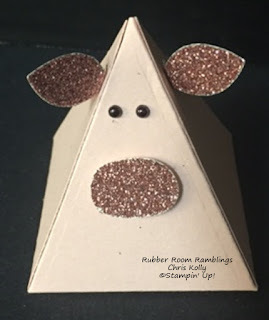 Rubber Room Ramblings: PYRAMID PALS PIG! The color on this photo is really bad, but this little pig is so adorable. In real life she is pink with the pretty beautiful Blushing Bride Glimmer Paper. This thinlit is available in the Occasions catalog and makes the most adorable boxes! ORDER YOUR BOX THINLIT HERE!